I remember pre-ordering Spyro a long time ago. I’ve played most of the games in the series and they were a lot of fun so why not right? After this trilogy I’m only missing one other trilogy and then I’ll be caught up with the franchise. The only real catch is that Spyro games are typically best when played one at a time. When you play all of them back to back like this then the issues start to show a little more. Still, this is a trilogy that has a lot of content for you to explore and it looks/plays pretty well. Certainly a must have for any big platformer fan. The first game has all of the dragons get turned into stone. It makes for an intense start since if everyone else was taken down how does Spyro have a chance? Also you have to keep in mind the fact that Spyro’s basically just a kid and the villain beat everyone with ease. Still, Spyro never backs down from a fight and prepared to win right away. It’s part of what makes him such a quality character. Enjoy the intro though as this game’s plot takes a back seat for most of the game. Spyro 1 has aged pretty well. Unlike Spyro 2 and 3 you won’t really need to back track in order to beat the game as long as you did a good job grabbing a lot of dragons and Gems. It didn’t feel like much of a grind at least. The 3D gameplay is quite solid and the level designs are on point. As this is the first game it got to experiment quite a bit and the sequels would tweak it all. The gameplay is pretty similar across all 3 games so I’ll mainly be tackling it here. You can glide for short distances and also shoot fire at enemies. Finally you have a ramming attack which can take down any enemy who has armor. Learn these combos well and you’ll be ready for the big time. Spyro 2 ramps up the plot as our hero finds himself in a new world when his portal generator didn’t work as expected. Here we have Ripto who has decided to conquer this planet since no dragons are around to save it. Well, Spyro won’t be having any of that and he quickly gets ready for action. Compared to the first game the dragons get a lot more respect here. Spyro alone is able to turn the tides of a planet wide invasion. How’s that for power? We also get introduced to a slew of supporting characters who will stay important for the rest of the franchise like the Cheetah and a new heroine. Spyro 2 is very similar to the first game in just about every thing from the level designs to the gameplay. It’s a fundamentally sound game, but the forced repetition starts to show up a bit here. If you want to beat the game you’ll probably have to go back to old levels to get a few more orbs. I like collecting things and earning trophies, but I always think that this should be a voluntary thing. When you start forcing players to go back and get various collectibles just to see the ending then the game starts to go a little too far. Still, there’s a good amount of content here and the controls are a little more streamlined. Then we have the third game. Spyro is back once more, but now a mysterious villain named Bianca has appeared along with her master. They rule the original Dragon World and Spyro has to stop them to show that justice always prevails. This game has a full story that has even more cutscenes than the first two. It easily has the most enjoyable plot and the gameplay is at its tightest. Unfortunately it has the most forced grinding in the game. You’re going to have to grab a whole lot of collectibles if you want to see the ending here. Not necessarily the kind of thing you want to hear in a platformer to be honest. You won’t be able to enjoy the levels as much as you would like since you have to be focused on grabbing all the gems and eggs. Throughout all 3 games the graphics are on point. Everything looks very sharp and modern. The developers did a great job modernizing the game without altering what makes it a classic. The soundtrack is less memorable, but it has some reasonable tunes thrown in. You’ll probably just forget almost all of them by the time you get through the game. On a technical level the game is good, but not amazing. As this is a collection is goes without saying that there is a lot of replay value though. The price is quite solid and it took me close to 13 hours to complete the game. If you go for all of the Platinum Trophies across the trilogy I expect you’ll be playing this game for close to 30 hours. The collecting will also be a lot more fun once you are doing it intentionally. Again, the trilogy does suffer from a lot of repetition. All 3 games are basically the same game in many respects. Unless you’re a really big fan of the game this could easily impact the score for you. However, if you take a break between games that should help considerably. I doubt I would even notice the repetition much if I had played them individually when they first came out. It’s not enough to lower the score or anything, but I still hold my position that being able to just blast through to the ending would have been pretty nice. Overall, The Spyro Trilogy is pretty fun. The game ultimately holds itself back from being great due to not being ambitious enough, but ultimately does what it sets out to do. The level designs are on point and you’ll be introduced to all of the big characters. I don’t think you’ll be able to find anything wrong with the level designs and the controls are quite easy to master. At the end of the day you may leave this trilogy feeling a little empty, but satisfied nonetheless. I still look forward to getting the final trilogy for Spyro one day, but it’ll probably be a little while. It was close between this game and the Crash trilogy, but I have to say that Crash ultimately did win the day. What it lacked in plot it made up for in gameplay. 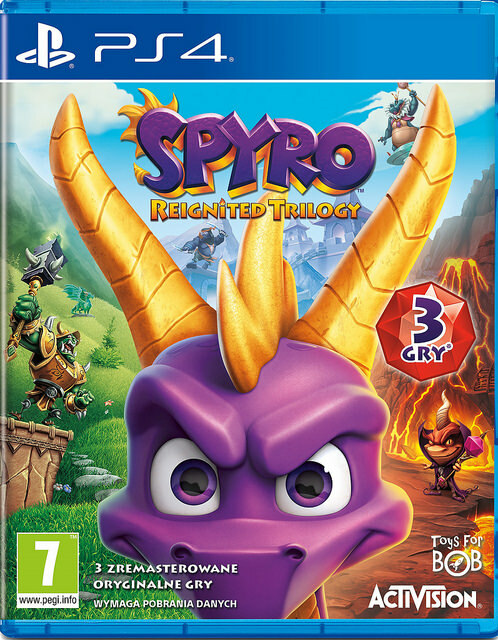 This entry was posted in 7 Star Games, Game Reviews, Games, Reviews and tagged Game Review, HD Collection, HD Remake, PS4, Reignited Trilogy, Review, Sony, Spyro, Video Game Review by dreager1. Bookmark the permalink. I got major motion sickness the first time I played Sypro and never wanted to play it again. I know a lot of people love this series (and Spyro himself is cute), but I still remember collapsing and feeling so nauseous. Oh, I can definitely see why you wouldn’t want to go back to it after that. My parents have a similar problem with the newer Mario Karts so I always play the older ones with them. There’s a lot happening on screen for sure so I can see how that could happen. With the updated graphics for the new one maybe that would help against that but you’re not missing a revolutionary platformer or anything at least.